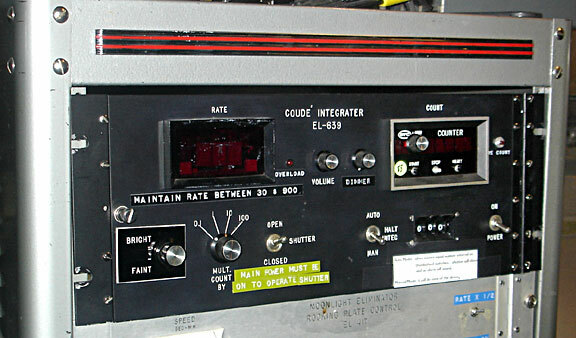 The Photon Integrator predates the Hamilton spectrograph, having been originally designed as an exposure meter for photographic plates taken with the old coudé spectrometers. It may optionally be used to estimate the progress of Hamilton exposures, and is now also used -- in conjunction with new software, Showmidpoint -- to provide an exposure's photon-weighted midpoint to aid with barycentric correction of precision radial velocity measurements. The integrator uses a rapidly rotating propellor/chopper, located just behind the entrance slit, to divert 5% of the light passing through the slit to a photomultiplier tube (PMT). The signal from the PMT gives an instantaneous measure of the throughput at the slit, and is electronically integrated to give a running, cummulative level for the exposure. To operate the integrator one should use the following procedure. Turn on the integrator. The power switch is located on the lower left of the integrator panel. Check the shutter, brightness, and multiplier dials to make sure they are properly set for your program. The usual settings are one step below "Bright", 0.1 multiplier, and Open shutter. Rarely are other settings necessary. Before turning on the PMT power, make sure the voltage dial is set to zero. Turn on PMT power supply. Slowly turn the dial to 705 (this corresponds to a voltage of ~135V on the display). Pull the plunger for the chopper to start it rotating (you should be able to hear the faint whir of its motion). You should also hear beeps from the integrator panel for each count detected by the PMT. The PMT is very sensitive to light and you do not want to subject it to the bright light of the arc lamps or quartz flat field lamp. You may protect it by closing its shutter (the switch in on the integrator panel) or by not turning on the PMT until you are ready for night time operations (this is the more common tactic so that the shutter won't accidently be left closed for data taking). When done with the integrator at the end of the night, shut it down in the following way. Push in the plunger. This ensures that the chopper is parked out of the way of the slit and will not block the light for future observers not using the integrator. Turn the PMT dial down to zero. Turn off PMT power supply.